Air Canada’s frequent flyer program, Aeroplan, just launched a bonus promotion where passengers who fly within Canada on Air Canada or Air Canada Express earn 75% bonus Aeroplan miles between now and October 21. To be eligible, you must register here with your Aeroplan number by October 21. Eligible flights flown prior to registration and within the offer travel period still qualify for the 75% bonus. Eligible fare classes are: Tango Plus (M, U, H, Q, V, W, S, K, L, T), Latitude (Y, B), Executive Class Lowest (D, Z) and Executive Class Flexible (J, C). Offer is not applicable to bookings in Tango class fares N, G, P, E or A. 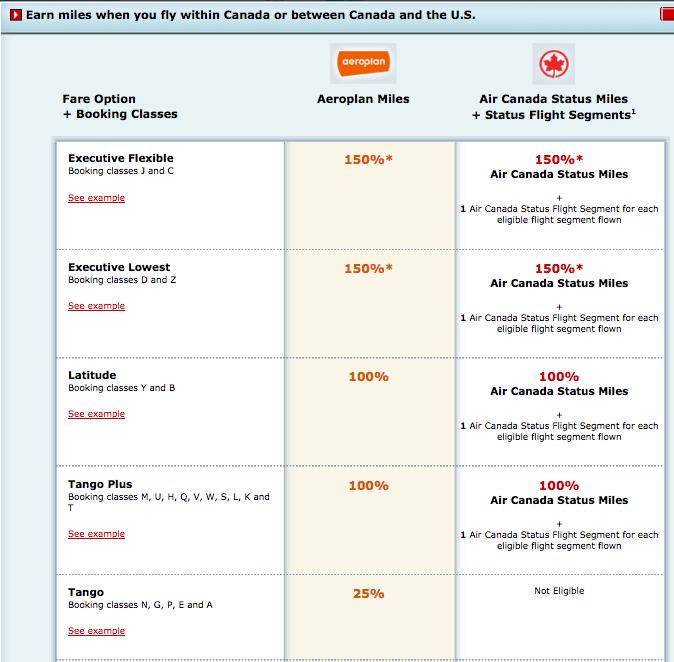 The bonus Aeroplan miles do not count toward Air Canada Top Tier Status, and will be earned based on distance flown per the fare mileage accrual rules. Class of service bonus miles and Top Tier elite status bonus miles are excluded. If you’re upgraded with eUpgrades, last-minute paid upgrades or Star Alliance Upgrade Awards, your bonus will still be based on the eligibility of the original booking class purchased. Miles will be credited up to three weeks after the qualifying flights are completed. The distance flown is 2,085 miles, here’s how many miles you’d actually earn with this promo. Aeroplan’s normal earning breakdown based on fare class. -With Tango, you’d earn just 25% of that and no status miles, for just 521 miles. -With Executive Lowest and Executive Flexible, you’d earn 2,085 base miles plus a 75% promo bonus on those plus a 50% class-of-service bonus on the base miles as well and 150% status miles on the base miles. So your total miles would be 6,776 miles. The biggest difference is between the discount economy Tango and Tango Plus. Paying $80 extra gets you 3,128 miles, so you’re paying about 2.56 cents a mile, not the best value, necessarily, but if you’re trying to top up your account, this might be an easy way to score enough bonus miles to get you to an award redemption.